Paris hopes to capitalise on Brexit to take over from London as the EU’s major financial hub. But this ambition could undermine France’s promise to broaden the Financial Transaction Tax, Eva Sas told EURACTIV France. 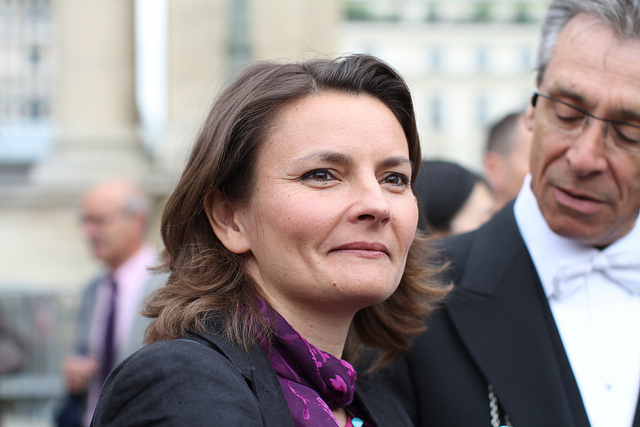 Eva Sas is a French Green MP. She is vice-president of the French National Assembly’s finance committee. Sas was interviewed by EURACTIV’s Cécile Barbière. The question of strengthening the Financial Transaction Tax (FTT) was once again raised during the examination of the 2017 French budget. What proposals are on the table to increase the revenue from this tax? We proposed that the FTT’s tax base should include day trading transactions, which consist of buying and selling shares on the same day. We also proposed an increase in the rate from 0.2% to 0.5%, and that 70% of its revenue be allocated to official development assistance, rather than 50%. The first two amendments were rejected, despite the fact that parliament last year voted to include day trading in the tax base by 2017. The proposal was finally struck down by the Constitutional Council for reasons of form rather than substance. The objective of the FTT is two-fold and doubly worthy: to regulate financial transactions and to fund official development assistance. But we have trouble passing amendments to strengthen it because today’s lobbies have an extremely long reach. Big businesses and banks have the ear of the government, and unfortunately this holds us back. In spite of this, do you think you will be able to gain the support of the French government and a majority of MPs for the taxation of day trading operations? This time, there was a very clear offensive by the French Banking Federation (FBF) to push back against the broadening of the tax base to cover day trading. They argue that it would weaken the competitiveness of the Paris financial centre, at a time when we should be trying to attract more business to Paris after Brexit. Their second argument is about the differentiation of day trading and high-frequency trading (HFT). According to the FBF, day trading brings benefits to the real economy, while HFT, a very speculative area of finance, is already covered by the FTT. But this is a false argument. Taxing day trading operations will allow us to catch all the speculative transactions that are not covered by today’s narrow tax base. Divisions over these proposals do not follow party political lines, but individual members’ proximity to the banking lobby. But we hope to force the government to move on one of the two criteria, be it day trading or the tax rate. We do not see how they could end this term with a refusal so clearly inspired by the banking sector. Especially on something that had already been accepted – albeit after a good deal of struggle – last year. As you said, the French government had previously accepted the taxation of day trading from 2017 in order to align the French FTT with its European equivalent, which will come into force this year. Do you think the European FTT is still workable? The problem is that this promise is made every year, so it is hard to believe. I think it could progress if we had a more ambitious French FTT to serve as a kind of example. But I must say I am fairly pessimistic about this subject and I do not think there is a real political will to make a success of the negotiations. A large share of the revenue from the French FTT is allocated to the official development assistance budget. This year, the budget will go up for the first time in five years. Is this enough? No, it is not. This is why we submitted amendments to increase the development assistance budget, notably by broadening the base and increasing the rate of the Financial Transaction Tax. Remember that in 2014, France committed to spending 0.7% of GNI on its international solidarity efforts. In 2015, it only managed 0.37% and is still a long way off achieving this objective. It is generally clear that development aid is not a priority in French politics. Is the FTT the right tool to increase the development budget? Under normal circumstances, the FTT should not be a substitute for budget credits, but an additional source of revenue. But when it comes to international aid commitments today, France is dragging the standard down rather than setting the example. Now we have to make up for four years of falling behind. But the political context is not favourable and the French public do not understand the importance of development assistance for international stability. The initial good idea, which was to have an additional source of funding for the development budget, has been distorted. Today, the problem is that the tax substitutes development funding, rather than complementing it. One of the arguments that has been made highlights the dangers of linking the development assistance budget to a tax whose revenue is designed to fall, as its main objective is to regulate speculation, and thus reduce the number of transactions that take place.